Walter Gill Counter was born in Yeovil on 8 December 1887. His mother, Emily Counter, was a domestic servant originally from Blandford, his father is unknown. In the 1891 census Emily Counter was recorded in the Yeovil Union Workhouse with her two illegitimate sons William aged 10 and Walter aged 3. By 1901 Emily had escaped the degradation of the workhouse and was working as a charwoman and living with Walter in a cottage in Bowering,s Row, a 'court' of six humble cottages off the north side of South Street, opposite Pen Hill. Perhaps to escape poverty, Walter enlisted in the Royal Marine Light Infantry as a reservist (Service No RMR/B/1831) and the 1911 census recorded him aboard HMS Antrim as a 23-year old Private of the RMLI. He also saw service aboard HMS Canopus and HMS Endymion. In the spring of 1913 Walter married Ellen Kate Spain at Eastry, Kent. They set up home at 5 Pollock Road, New Kent Road, near the Elephant and Castle in south east London. At the outbreak of war, however, Walter was immediately called up to serve on HMS Aboukir. HMS Aboukir was a Cressy-class armoured cruiser built for the Royal Navy around 1900. Upon completion she was assigned to the Mediterranean Fleet and spent most of her career there. Upon returning home in 1912, she was placed in reserve. Re-commissioned at the start of World War I, she played a minor role in the Battle of Heligoland Bight a few weeks after the beginning of the war. The First Battle of Heligoland Bight was the first naval battle of the First World War, fought on 28 August 1914. Three German light cruisers and one destroyer were sunk. Three more light cruisers were damaged, 712 sailors killed, 530 injured and 336 taken prisoner. The British suffered one light cruiser and three destroyers damaged, 35 killed and 40 wounded. The battle was regarded as a great victory in Britain, where the returning ships were met by cheering crowds. However, shortly after, the 'Action of 22 September 1914' was a naval engagement that took place in which three obsolete British Royal Navy cruisers, manned mainly by reservists and sometimes referred to as the "livebait squadron", were sunk by one German submarine while on patrol. On patrol were three cruisers, Aboukir, commanded by Captain J Drummond, Hogue, and Cressy. The cruisers were part of the Royal Navy’s 7th Cruiser Squadron, which was assigned patrol duties in the North Sea, supporting destroyers and submarines of the Harwich Force to guard against incursions by the German Navy into the channel. Aboukir was sunk by the German submarine U-9, (under the command of Kapitänleutnant Otto Weddigen), together with her two sister ships, on 22 September 1914; 527 men died aboard the ship, including Walter Counter who went down with her. He was aged 27. At 06:00 on 22 September, the weather had calmed and the ships were patrolling at 10 knots (12 mph; 19 km/h), line abreast, 2 miles (1.7 nmi; 3.2 km) apart. Lookouts were posted for submarine periscopes or ships and one gun either side of each ship was manned. U-9 had been ordered to attack British transports at Ostend, but had been forced to dive and shelter from the storm. On surfacing, she spotted the British ships and moved to attack. At 06:20, the submarine fired one torpedo at the nearest ship from a range of 550 yd (500 m), which struck Aboukir on the starboard side, flooding the engine room and causing the ship to stop immediately. No submarines had been sighted, so Drummond assumed that the ship had hit a mine, and ordered the other two cruisers to close in to help. After 25 minutes, Aboukir capsized, sinking five minutes later. Only one boat could be launched, because of damage from the explosion and the failure of steam-powered winches needed to launch them. At 07:20, U-9 fired two torpedoes from her stern torpedo tubes at a range of 1,000 yd (910 m). One missed, so the submarine turned to face her one remaining bow torpedo toward Cressy, and fired at a range of 550 yd (500 m). Cressy had already seen the submarine, had opened fire and attempted to ram, but failed. The ship had then returned to picking up survivors. The first torpedo struck the starboard side at around 07:15, the second the port beam at 07:30. The ship capsized to starboard and floated upside down until 07:55. Approximately 1,450 sailors were killed altogether, and there was a public outcry at the losses. This incident eroded confidence in the British government and damaged the reputation of the Royal Navy at a time when many countries were still considering which side in the war they might support. The surviving cruisers were withdrawn from patrol duties; Admiral Christian was reprimanded, and Captain Drummond, who did not survive, was criticized by the resulting inquiry for failing to take the anti-submarine precautions recommended by the Admiralty. However, he was praised for his conduct during the actual attack. By contrast, Weddigen and his crew returned to a hero's welcome; Weddigen himself was awarded the Iron Cross, 1st Class, while his crew each received the Iron Cross, 2nd Class. The reputation of the U-boat as a potent weapon of war was established. On 2 October 1914 the Western Gazette reported "Private Walter Counter, a reservist of the RMLI, a son of Mr and Mrs Counter of 2 Clarence Place, Huish, Yeovil, was on board HMS “Aboukir” at the time the vessel was torpedoed in the North Sea, and as his name does not appear amongst the lists of those saved, much anxiety is felt by his friends. Private Counter, who had been living in London with his wife, joined the RMLI at the time he was single and living in Yeovil. He served on the Endymion at the time that ship, with others, escorted the Russian battleships to Tangiers after they had fired on British fishing vessels off the Dogger Bank. 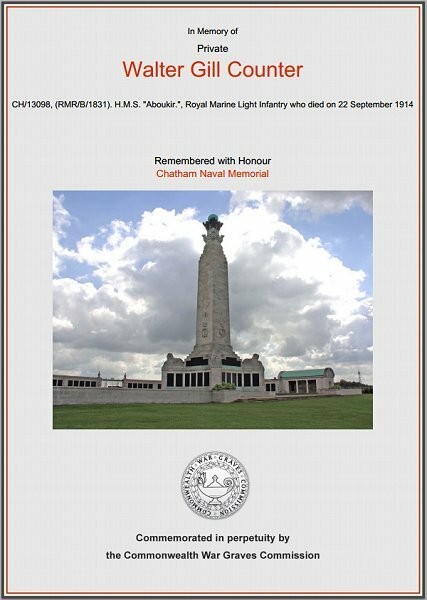 He also saw service on HMS’s Canopus and Antrim, but on the outbreak of war he was called up for the “Aboukir.” His mother yesterday received a letter from the Accountant General of the Navy regretting to have to inform that Private Counter’s name “does not appear in the list of survivors in this department up to the present." Walter Counter's name is recorded on Panel 7 of the Chatham War Memorial and also on the Yeovil War Memorial in the Borough - albeit as Counter, W rather than the correct Counter, WG. The Commonwealth War Graves Commission certificate in memory of Walter Counter.